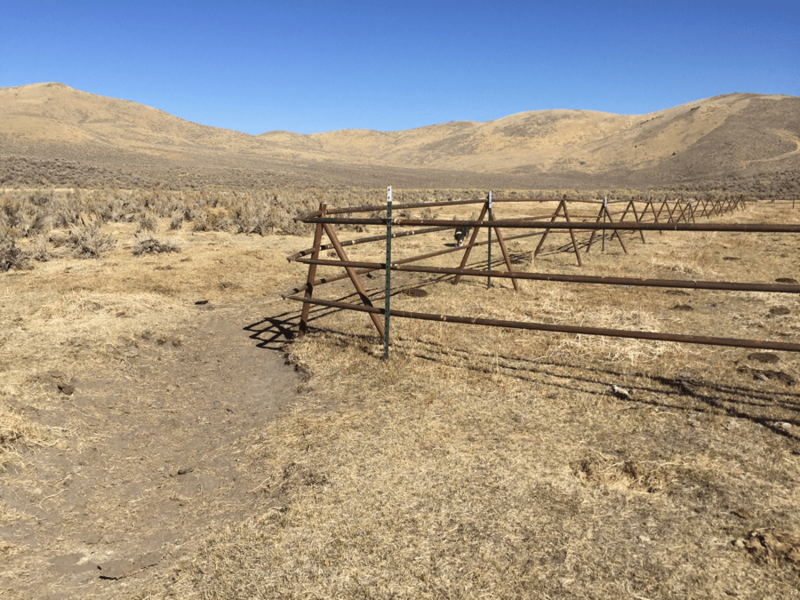 The NRST drove by the area of dead grouse spring and the dying meadows enroute to the “Park” area to do MIM monitoring inside what was proposed as a new exclosure under segmented Argenta cow project Round 3. 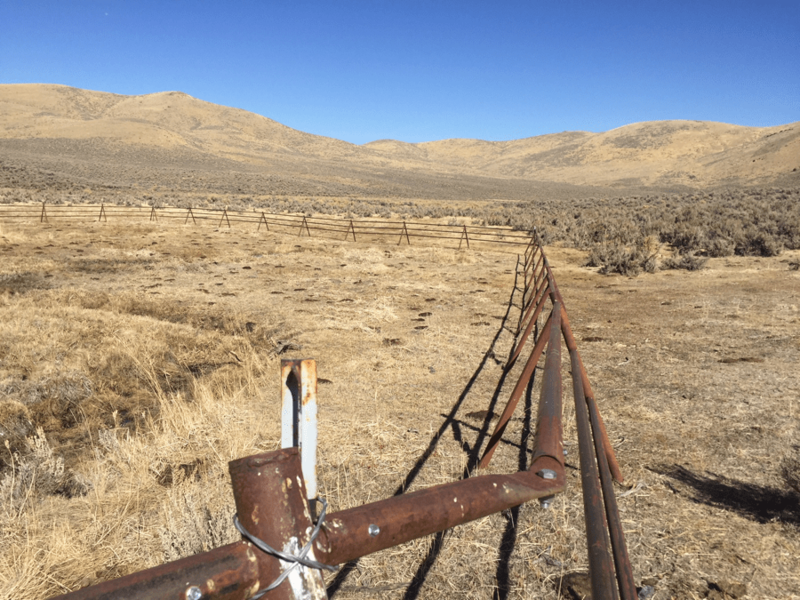 When leaving the site, I noticed new fencing in the distance – no one made mention of the fact that there had been a new ugly and expensive metal pole Park exclosure built in a previous year, and it had already had been seriously trespassed in 2017. Cows either broke in or were let in – desperate to get at spring water and greenery in this little exclosure built in 2015 or 2016 as part of a segmented series of band-aid exclosures ramrodded through by the NRST Group to try to rig the outcome of a Land Health Assessment process. This situation highlights the idiocy of the NRST “experts” later proposed fencing scheme in The Park (discussed in separate Field Report). Two more little band aid exclosures, separated by a squalid water gap were to be built on a downstream springbrook in the Park as well – encompassing the monitoring site. The watershed will continue to dry up. Its ability to provide sustainable surface water and sage-grouse brood rearing habitat is being destroyed. With a series of segmented fencing schemes, the NRST rancher cabal has imposed new elevated vantage points for avian predators to pick off grouse chicks (as the agency claims happens from trees). Each of these ugly band aid fence perch gifts to avian predators is costing the public likely fifty thousand or more dollars apiece when one takes into account all the haggling, covering up of impacts and staff time that goes into these. As each new fence is built, unfenced areas suffer even more negative impacts. BLM has been forced to sit back and letting the permittees under the cover of the NRST and its expensive cow consultants and their fences and “Stockmanship Plans” to further irreversibly damage and irreversibly destroy these watersheds and crucial sage-grouse habitats that are vital to a dwindling population. Wiping out birds in the remaining areas of this cow battered landscape benefits commodity and extractive uses. That sure seems to be the NRST CMG end game here. Wipe out grouse so they no longer are an impediment to the drought ranchers. New NRST exclosure built previous year but trespassed in 2017. 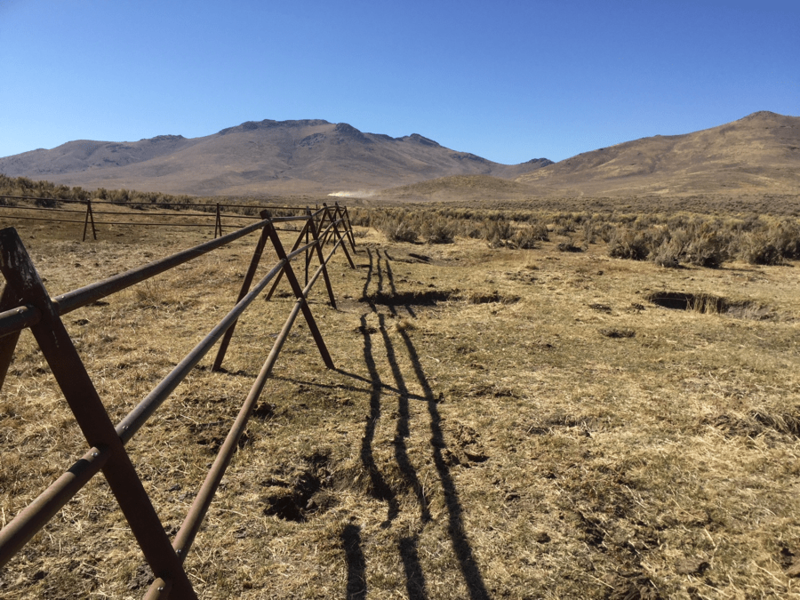 BLM has claimed this very expensive, ugly iron fencing is impervious to cows, and does not provide raptor perches. Both are not true. Raptors appear to love the fencing, as whitewash shows abundant evidence of perching on uprights and cross poles. 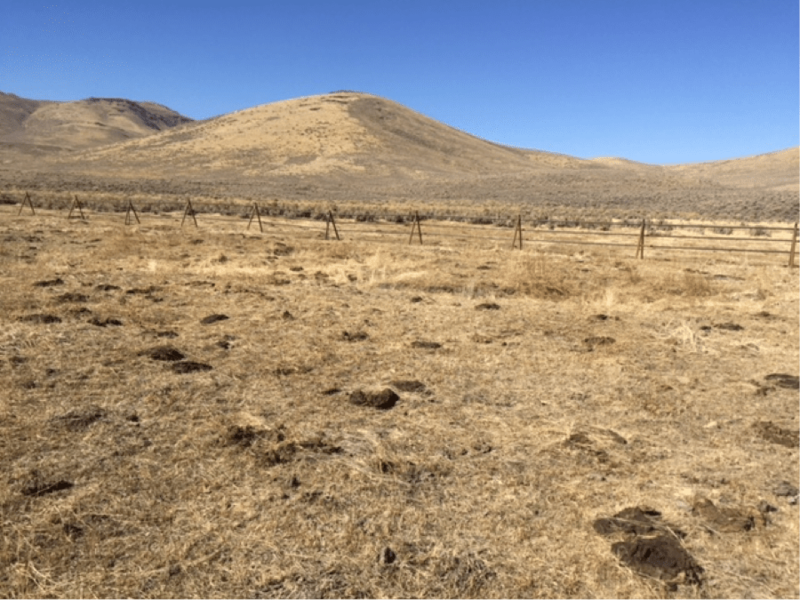 Harmful NRST cow consultant “Stockmanship” plans that embrace severe cow disturbance have already resulted in new bared areas in the dying meadow along the fence line. Raptor whitewash. BLM spends hundreds of millions of dollars killing trees ostensibly to “save” sage-grouse from trees providing elevated perches for raptors to perch in. 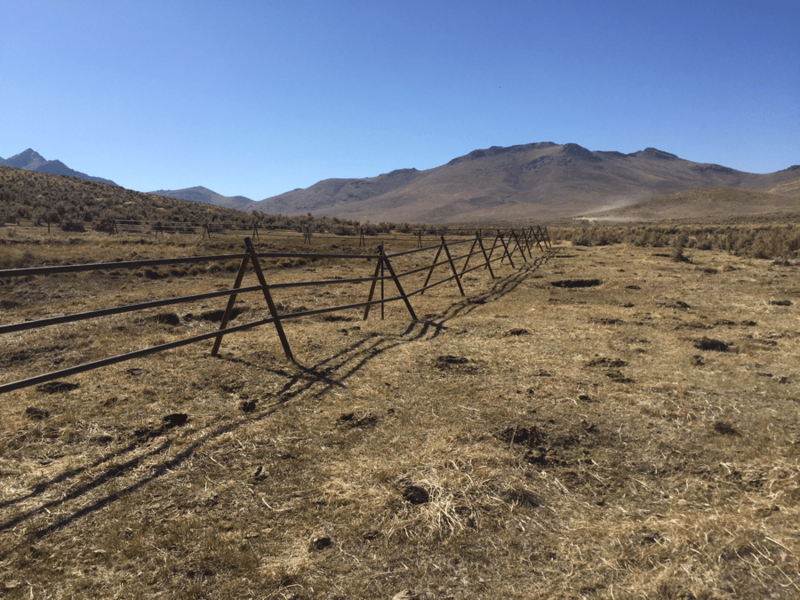 The NRST Team of cow apologists is a one trick pony – the only riparian “protection” measures the Team uses is more and more fencing (and elevated perches)– which only serves to shift and intensify cow use outside the band-aid fences. 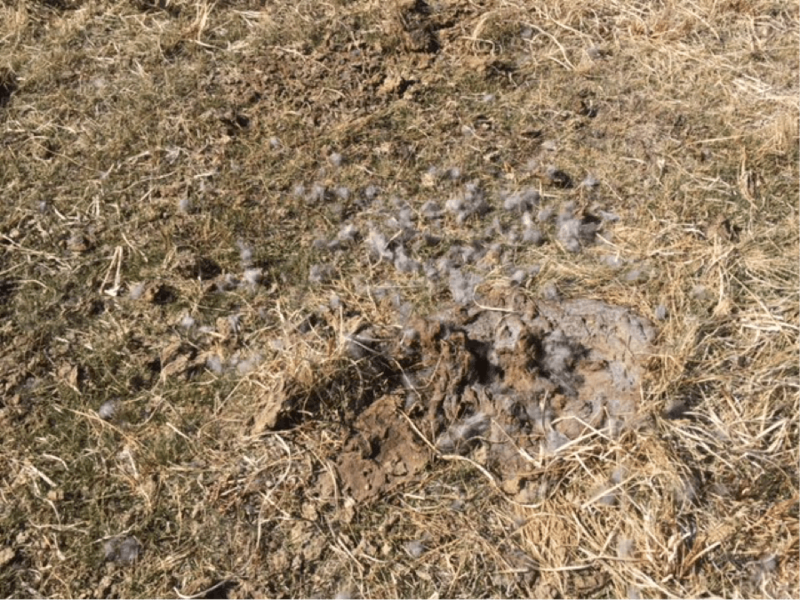 Remains of a victim of predation by the ugly new NRST trespassed Park exclosure. The cows have stripped protective cover both inside and outside the exclosure.